Summer is in full swing! It’s the season for neighborhood block parties, floating on the river, and berry picking. We know you are busy so we want to keep this summer newsletter brief with a fun summer activity idea, introduce our newest team member, and provide you with a market update. As promised, we won’t be flooding your inbox with pie recipes. We thought this chart from Hood River Fruit Loop of berry and fruit harvest seasons would be much more useful so that you and your family and friends can plan a fun day picking your favorite fruit or berry this summer. Their website also has a helpful map of the different farms to visit in Hood River for berry and fruit picking that you can see by clicking here. Our team has grown! Meet the newest edition to our team, Kellie Hawkins. Kellie has been in the real estate business since the late 1990s. She has a passion for design and decorating so is always able to help stage and get your home looking its best for market. You can find me enjoying the outdoors and spending time with my family. I love to run, ski, garden, travel, and take in Oregon’s Wine Country. I am the proud mother of 14 year old twins, Parker and Madison, who keep me busy with sports and other activities. As a native Oregonian, I am pleased to call this beautiful state my home. The next time you’re poised to enter the market, I’d be honored to guide you through this important experience. You can reach me at kellieh@macgroup.net or 503.816.5214. We’ve been having some HOT days recently so here is a map of the “HOT” neighborhoods in Portland this year. 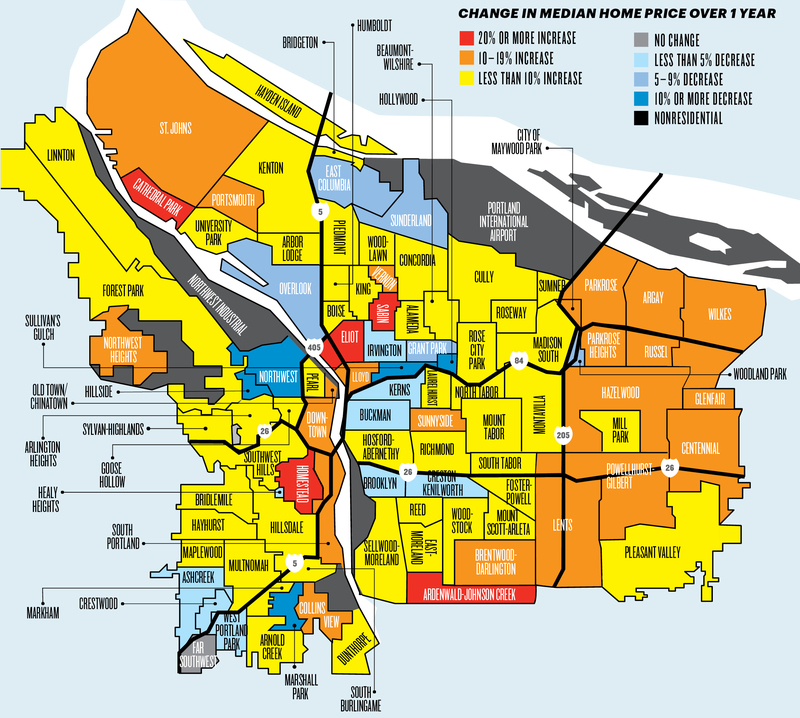 Click on the above map to view a full-size version from the Portland Monthly article “Portland Neighborhoods by the Numbers 2018: The City” published in the April 2018 issue. The Portland market saw cooler activity in June, compared to June 2017. The last time we saw closed sales this low was June 2014. There are a couple key contributors impacting these stats. For the first time since 2015, new listings are up 2.7% compared to the previous year, while pending sales and closed sales are down almost 2%. This equates to more inventory available on the market. Another key contributor is the rising interest rates. I’d anticipate these numbers to slow but hold steady in the 3-5% range over the next 12 months. As we move into the late summer and early fall months, expect this cooling trend to continue. Please call me or email me, if you would like to discuss the current state of the real estate market in Portland in more detail at 503.313.8841 or scottb@macgroup.net. Please click here to view the most recent Portland Metro RMLS Market Action Report. If you are interested in market trends and statistics, you may enjoy signing up for Neighborhood News. This is a useful tool to monitor current market activity and trends. Once you subscribe, you will be emailed a monthly report of statistics for your desired zip code of active listings, sold listings, pending listings, time on market, price trends, etc. You can even search different zip codes! To sign up please click on the link below and follow the instructions to subscribe.